In the first-tier sorting, a bulk sample is split into 35 different insect orders, suborders or comparable units. Other groups than the insects are sorted as suitable. Specimens, once identified by the assorter, are placed in 7 ml (h = 50 mm, Ø = 16 mm) flat-bottom vials made from transparent polystyrene by Sarstedt. Vials are tucked in transparent polycarbonate racks with 24 (4 x 6) fitting apertures each. Two racks are placed in accordance to two printed schemes which refers to where the different target taxa shall be placed (see picture above). Lepidoptera specimens are put aside for drying on a paper towel and, when they have become completely dry, are stored in plastic containers with tightly fitting lids. At the pictures upper left are some filled vials. More than a thousand samples, abundant in Malaise Traps despite lack of flight ability. None yet treated. Not recorded, belongs to soil fauna, flightless and not very mobile. Not recorded, belongs to soil fauna, flightless. Not recorded, primarily indoors, flightless. Several samples. None yet treated. A few samples, generally rare in Malaise traps, mainly because of very good eyesight and maneuvering capacity. Most identified by Rasmus Hovmöller and Sibylle Häggqvist. PLECOPTERA Burmeister, 1839 Stoneflies/Bäcksländor (37)Several samples. Treated or under treatment by Anders Göthberg. Hundreds of samples. Primarily indoors except a single widespread species. Hundreds of samples. Common, including flightless life stages. None yet treated. Hundreds of samples. Common, including flightless life stages and species. Many treated by Bo W Svensson. Ref: utilised but not explicitly referred to in Svensson 2010. Several samples. Not entirely uncommon in the traps, despite being flightless and not very mobile. Vertebrate hosts accidentally caught in traps are not a sufficient explanation for this number, instead we have to assume that they have entered spontaneously climbing up from vertebrates (especially Roe deer Capreolus capreolus) taking shelter by the trap. None yet treated. Hundreds of samples. Many identified by Sverre Kobro and Carl-Axel Gertsson. One species new to Sweden. Ref: Kobro 2011. Hundreds of samples. Common, including flightless life stages and species. Many treated by Gösta Gillerfors, some under treatment by Carl-Axel Gertsson. Hundreds of samples. Common, including flightless life stages and species. Treated or under treatment by Carl-Cedric Coulianos. In spite of being a relatively well-known group which is not regarded as specifically targetted by malaise traps, at least one new species to the country has been found in the material. Very few samples. Some treated by Johannes Bergsten. Several samples. Some treated by Johannes Bergsten. Hundreds of samples. Some under treatment by Johannes Bergsten. Hundreds of samples. Some treated by Bengt Andersson, some by Ron Felix. Several samples. All treated by Rasmus Hovmöller. Hundreds of samples, all temporary, only an intermediate stage in sorting. Hundreds of samples. Some treated by Kjell Arne Johanson, some treated or under treatment by Anders Göthberg. More than a thousand samples. Also larvae, of course flightless, are not uncommon. Some identified by Mats Lindeborg, Dave Karlsson and Markus Franzén. Hundreds of samples. Some treated by Johannes Bergsten. Very few samples. Flightless and considered unlikely to end up in malaise traps unless vertebrate hosts are accidentally caught. None yet treated. More than a thousand samples; an intermediate stage in sorting. No samples without certain families picked out. Brachycera excl. PhoridaeSeveral samples; an intermediate stage in sorting. Brachycera excl. Phoridae, Sepsidae, Asilidae & Syrphidae. More than a thousand samples; a formerly used intermediate stage in sorting. Several samples, in spite of lack of flying capacity. Many climb trees and other vertical surfaces. No samples yet treated. 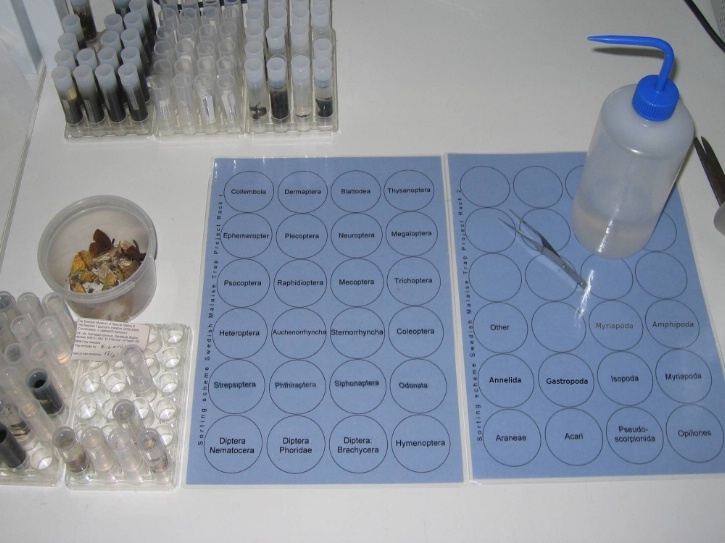 Several samples, in spite of lack of flying capacity; woodlice mainly belong to soil fauna and are sensitive to dehydration but still are well-known to climb trees and other vertical surfaces. No samples yet treated. Very few samples; unexpected since sandhoppers lack flying capacity and stay close to water. None yet treated. Numerous samples, in spite of lack of flying capacity. Many climb trees and other vertical surfaces, and of course spiders are often deliberately wind-spread. A large fraction has been sorted into families and are under treatment by Fredrik Arvidsson in a student project. Hundreds of samples, in spite of lack of flying capacity. Many climb trees and other vertical surfaces. None yet treated. Several samples, in spite of lack of flying capacity. Frequently phoretic with insects. None yet treated. More than a thousand samples, in spite of lack of flying capacity. Frequently phoretic with and parasitic on insects. Some under treatment by Jeanette Stålstedt. Ref: Stålstedt 2014.
few samples, in spite of lack of flying capacity, more than 200 specimens found this far. It is well known that earthworms sometimes climb trees and other vertical surfaces, but the extent of this, and its meaning, is little known. No samples yet treated. Hundreds of samples, in spite of lack of flying capacity. Of course many snails climb trees and other vertical surfaces. No samples yet treated. single sample, unexpected mainly because of large size and good maneuvering capacity. Identified as Northern Bat, Eptesicus nilssoni. single sample, unexpected mainly because of large size and good maneuvering capacity. Identified as Yellowhammer, Emberiza citrinella. Some very few samples, unexpected mainly because of lack of flying capacity. Identified as Viviparous Lizard, Zootoca (or Lacerta) vivipara. Some very few samples, unexpected mainly because of lack of flying capacity. Identified as Smooth Newt, Lissotriton (or Triturus) vulgaris. Remarks For each taxon the total number of known species in Sweden are given in parentheses (including accidentals). Taxa considered non-monophyletic are in quotes. Note that the classification given here is not necessarily a state-of-the-art valid classification in all details, but represent the actual units in SMTP sorting.